It would be fair to say that Costa Rica has really come into its own over recent years in relation to tourism. While it has always been popular, over the last few years it has become the pin-up of travel brochures as more and more tourists start to flock there. With a population of just 4.8 million people, one might be under the impression that the amount of things to do in this country are few and far between. However, this isn’t the case in the slightest, and the amount of places to visit in Costa Rica is extravagant to say the least. Unfortunately, the scope of this guide isn’t going to cover each and every one of these places. Instead, it’s just going to focus on the best ones, and we will now take a look at four of these to whet your appetite. This first attraction is the one that the majority of travel brochures showcase, and it’s for good reason. 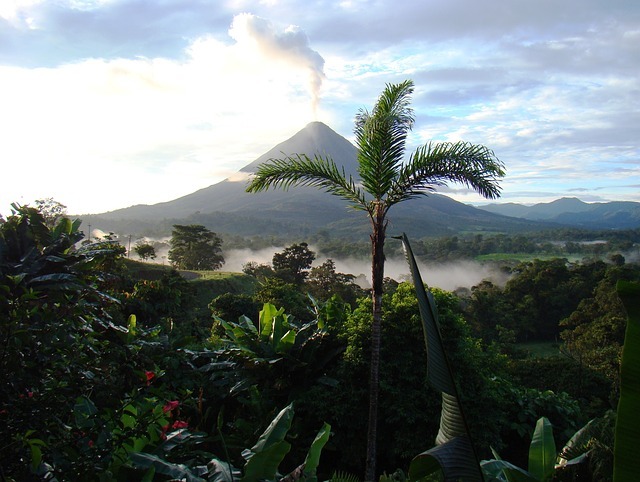 The fact that Volcán Arenal was an active volcano as recent as 2010 speaks volumes, but it’s the sheer beauty of the surrounding forests and local towns that make this a picturesque attraction for visitors. There is a national park located within the area, which is excellent for hiking, while you will also find hot springs which can just bring something else out of your visit. On the subject of national parks, let’s give a mention to Parque Nacional Manuel Antonio. Costa Rica is famous for its national parks at the best of times and there’s no doubt that this one is the most popular. This is a national park that is dominated by monkeys, who are happy to hop around you as you venture on one of the many hikes that are available in the area. You can opt to wander through the forests which form part of this park, or venture near the shore. Both are utterly beautiful and again paint Costa Rica at its best. In comparison to the other attractions we have spoken about, Central Valley doesn’t necessarily have the immediate wow-factor that woos so many visitors. What it does have, however, is an excellent scene for white water rafting. Some regard this as the best for the sport in the whole of Central America, so if adrenaline is your thing this should be high on your priority list for your trip. If Reggae is your thing, look no further than this final attraction on our list. This is something which well and truly basks in Reggae, right the way to the food on offer to the music that is seemingly played through both day and night. Many view this as the other side of Costa Rica; the side which doesn’t necessarily represent the country as a whole. It has a huge Afro-Caribbean culture and this just adds to the charm of the overall area.